Subatomic Studios goes behind the scenes to enhance its already stellar iOS title. 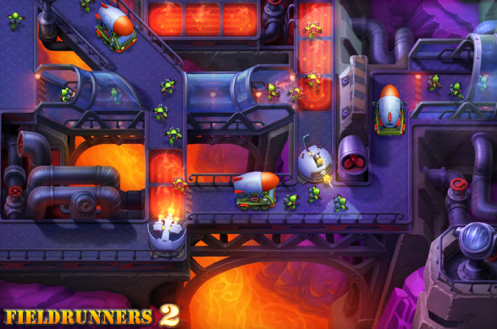 To play Fieldrunners 2 is to love it, especially following today's update that brought even more content to Subatomic Studio's exquisite iPhone game. The list of new features and improvements is quite extensive, from a new time trial map called Flash Fire, to glitch free music and a Casual mode. Now how about that full screen iPad support? -Beat those hard levels with an easier Casual mode! -Amazing new time trial map - Flash Fire! -Conquer the leaderboards with Game Center! -Faster levels fit your on-the-go lifestyle! -Finally beat Scrambled Eggs on Hard! -Can you spot the changes in Bizarre Bazaar? -Get coins for sharing scores on Twitter! -Glorious music is now bug free! -Enable low-fi mode to fix crashes! -Save your progress when exiting maps! -Push notifications that won't annoy you! -Tackle the challenging Endless mode! -General bug fixes and more!